Baltimore, MD 21218Featuring: Nan McCurdy, founderandShared memories by us all! Please bring a potluck dish, or make a donation toward beverages & side dishes ($10 suggested – no one turned away). Attendees will get a free “memories booklet,” and a book of photos will be on sale. We’re looking forward to this evening, to see old friends and remember all the good times. Please RSVP to help us plan – 410-662-6292 or 443-603-8268, or info@CasaBaltimoreLimay.org. 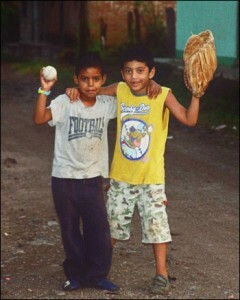 Want to Learn More about Nicaragua or a Related Topic? Casa Baltimore Limay is looking for topics that would be of interest to the community and to members of Casa Baltimore/Limay as focus points for future gatherings and educational opportunities. If you would like to make a suggestion for a topic that you feel would be of interest, please take a moment and tell us about it. Just scroll down to the “POST” section on the right-hand menu and click on “Educational Topic Suggestions”. We certainly appreciate your suggestions. Thanks to everyone who attended Fiesta Tropical on Sunday, February 28. We were blessed with two great musicians — Hector Muñoz on South American harp and Ulises Rodriguez on guitar — followed by superb salsa instruction by Eric Hehl of Dance in Time Productions. Claudette Rhone then performed a “Candle Dance” — wow, it was marvelous. Guillermo Brown, WEAA’s DJ for Latin music every Tuesday night, closed out the event with some high-energy numbers. Casa Baltimore/Limay volunteers prepared a fantastic buffet including pineapple fried rice, three kinds of empanadas, tamales de elote, Cuban beans and rice, grilled vegetable fajitas, vanilla pineapple refresco, and tropical fruits and dips. Other highlights included a video display of Nicaraguan scenes and folk dances, massages and free photos of attendees. It was great fun! Proceeds from this fundraiser go to Casa Baltimore/Limay, a friendship-city project linking the Baltimore region with San Juan de Limay, Nicaragua, for over 24 years. February 2010: On Sunday, February 28, please join our Fiesta Tropical with a Nicaraguan beach theme. SUNDAY, FEBRUARY 28, 5 TO 9:30 P.M.
ADVANCE TICKETS (deadline Thursday, February 25) – $25 one adult, $20 additional adults, $10 children ages 6 to 12, free ages 5 and under. Our friends from San Juan de Limay, Nicaragua – Angelica Gonzalez and Edwin M. Corea – left Baltimore a week ago Wednesday. During their two weeks with us, they experienced a series of visits, sightseeing, and speaking engagements that included (whew!) a weekend Nicaragua Network (Nicanet) conference and concert, five colleges, two high schools, two churches, and our own Casa Baltimore/Limay public dinner event. 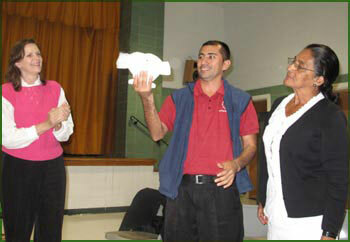 Edwin and Angelica presenting a carved soapstone (“marmolina”) sculpture, featuring two hands joined in friendship, to the Baltimore members of Casa Baltimore/Limay. Barbara Larcom (left) accepted the gift on behalf of the group. Casa Baltimore/Limay is sponsoring a delegation of two visitors from San Juan de Limay, Nicaragua, who will be in Baltimore October 14 – 27, 2009, representing the ongoing friendship between our peoples over the last 24 years. Oct. 16 – 18 in Baltimore! Mark your calendar for Oct. 16 – 18 which will be the regional meeting of the Nicaragua Network in Baltimore, MD, hosted by the Casa Baltimore/Limay sister city committee! For over 30 years Nicaragua Network has helped to bring together groups and individuals working in solidarity with the people of Nicaragua. Y Baltimore será la gran ciudad que por siempre con nosotros está. Mario Zamora practicing his song for the fiesta. Everyone at the party clapped with delight. Our visiting January delegation was enfolded in love from our friends in San Juan de Limay, Nicaragua – and we gratefully returned their love. Mario Zamora performed his new composition to express appreciation for the friendship and help that Casa Baltimore/Limay brings to the town. He is one of our scholarship students. Afterward, feeling very moved, I spoke to the gathering briefly. I thanked Mario for his great song and said that Baltimore and Limay have a friendship por siempre, for always. Do you realize how highly people in Limay regard you – and others like you – because of our friendship projects over the past 23 years? You are making a difference in the world through your participation – your donations, your time, your ideas, your caring.